Well, we couldn’t have asked for much more from the Lodden Valley Kite Flyers team this year – congratulations to all involved in this wonderful event. The weather couldn’t have been better (although the wind was a little tricky) with blue skies to show off the amazing artistic kites on display. We were thrilled to be able to fly Nick James‘ Angles; Janneke Groen‘s stunning constructions and Bruno Cocandeau’s absolutely amazing new take on a four-line kite… starting from the other end! 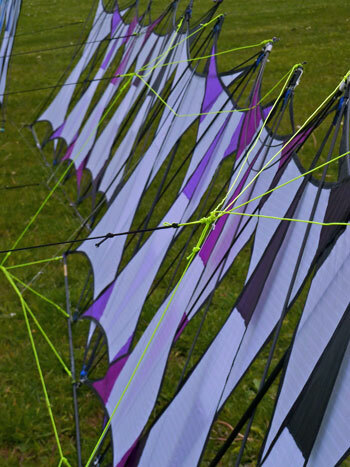 Bruno has designed these incredibly beautiful kites based on his amazing and highly structured single line frames and sails. He told us he is not a four-line flyer, but wanted to see how his kites would fly if they had four lines … and this is the result.